Kiteboarding packages are the fastest way for you to get started in the sport of kitesurfing. Kite boarding is an outdoor sport, which is a combination of surfing and flying kites. This is something every outdoor sport enthusiast would love to master since it offers unlimited dose of fun and entertainment apart from being a great work out for the fitness freaks. This new aquatic sport can be easily mastered through proper training and kitesurfing equipment. As a beginner, equip yourself with kite flying skills prior to your first kite boarding lessons. A strong kite flying skill will help you grasp the kite boarding strategies easily. A good learner’s video by an experienced instructor is one way of picking up the other skills. Learning about terms like wind window, the area where you fly kites is also important when you start with kite surfing. 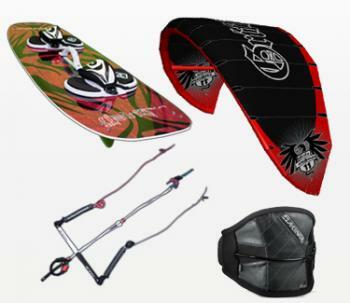 Purchase your kiteboarding gear from a reliable dealer, one who offers good quality and affordable kits for you. Your kitesurfing equipment may include Kite Helmet, Kite Harness, Kite surfing golf bag, Kite buggy, Paddle board, a long board, land board and a mountain board. Beginners can choose either a two line or three line kites, but Power Kites recommends a 3-line kite for two reasons: one is for the Safety Reflex Response and second is that it offers you a chance to launch your kite again. Power kites can be used by people of ages above four, provided that sufficient safety precautions are taken for kids and old people. What about the size of your trainer kit? The trainer kit size depends on your weight, if you weigh somewhere around 185 lbs Power Kites recommend 3.5 m long kite while 125lbs would mean 2 m long kite is sufficient. The products listed on the website are carefully selected by Power Kite. So, are you ready to go with your Power kitesurfing equipment on a fun filled kite surfing experience?